I know it's Saturday, but I was at work all day today but I'm involved in a good final project before I leave on the 31st. After work, I spent the evening refining the kayak on/off the roof procedure, and I've simplified it quite a bit. 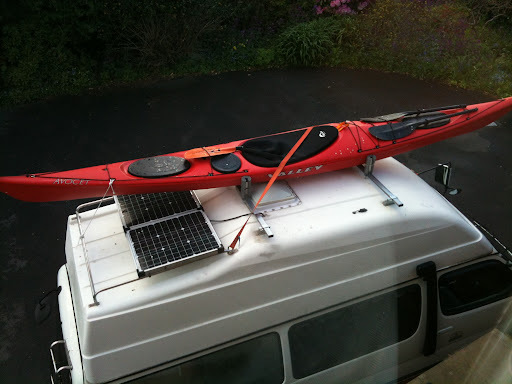 I can now load it single handed and attach it to the roof rack all without the use of any extra ladder. Very cool. At one point this did seem like an impossibility, but with a little time and ingenuity such things become possible. I've even used the spray deck to enclose the paddle and keep the rain out too. View from above with spray deck on. I'm feeling pretty good today as more and more, things are coming together and finding their way as I prepare to move on..
Later on I watched Swedish noir drama 'Arne Dahl' on BBC4 - check it out on iplayer. Great series, and with each story broken into 2 x 45 min episodes, its something you can really get involved in. No breaks, so have everything you need ready, you won't want to miss the subtitles!